The heat! Man, this has been an unusually warm summer so far, at least where I’ve been sitting here in Barnes. Not only have we had gloriously sunny hot days, but now we’re having muggy, overcast hot days too. If you are menopausal, this constitutes a bit of a nightmare, which might find you spending your days dreaming of moving to Alaska. What we need is a light but structured throw on to cover arms/absorb sweat/look decent in order to maintain sartorial togetherness and not die from heat stroke. I was in Covent Garden last week and popped into the East store to update my knowledge on the brand, because their team has been encouraging us to re-look at the range. 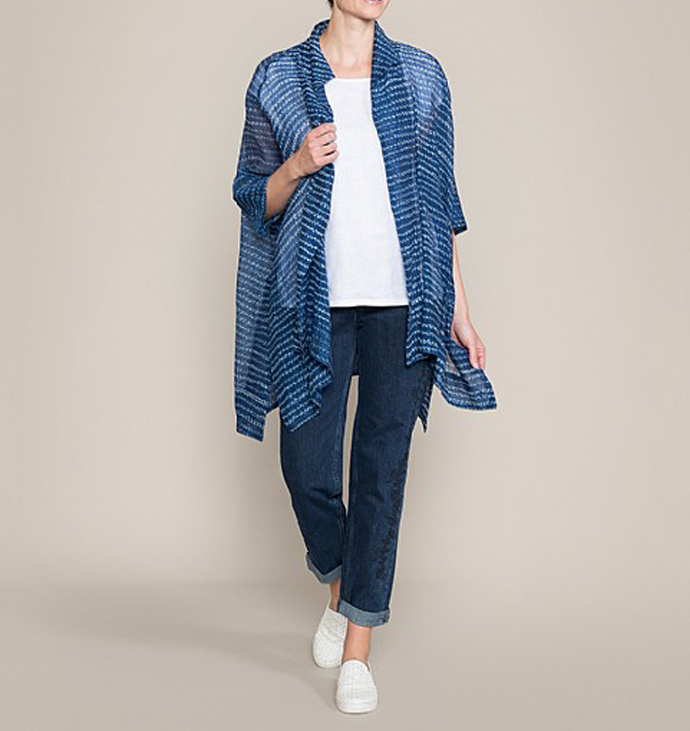 I liked the lightweight-but-crisp Faria cotton/silk jacket, which is exactly the thing. It’s made from a traditional Japanese hand-dying technique, Shibori. The brand has always supported hand crafted dying and embroidery and I love the Indian-made Anokhi collection, it’s a perfect cotton weight for really hot weather. I have an Anokhi beach kaftan, bought from the Jaipur flagship store in India in 2006, which is still going strong. The Faria is an oversized unstructured jacket/shirt, made of a fine, semi transparent fabric which would be easy to throw on and off depending on the temperature. The indigo blue is right up my street and the timeless shape would work with a smart or casual look. It’s quite an investment currently (£235) but it will I suspect, eventually head to the sale if you can wait. 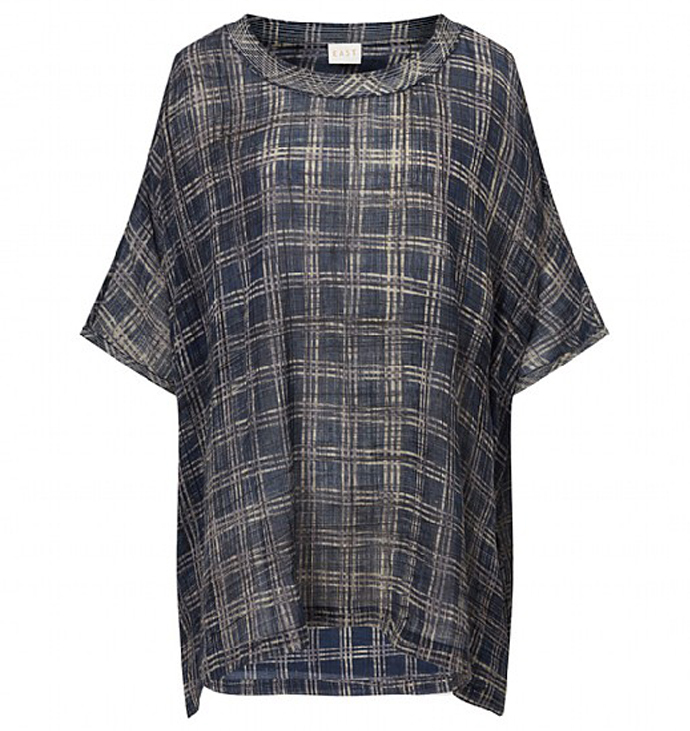 The same fabric is used in the hand painted checked top above, from the Neeru Kumar range, which might not look much in the image, but is rather lovely IRL. And the indigo is easy to wear. I also like the fact that the range is available up to size 20 as a matter of course. The above Shirin print jacket, from the Anokhi soft cotton collection, would make a great summer cover up too, great over white jeans or a summer dress. There are plenty of sale bargains in the kaftan/summer top ranges if you are still looking for some holiday outfits, see more here. Do any of you buy regularly from East? The shop was stuffed full (an increasingly unusual thing with London stores) of women of 40plus when I visited, I’ve put a few more of my fav ‘spots ‘below. What’s your view on the brand? Previous articleWhen did fashion get so expensive? Sadly our East has closed but can still see some at John Lewis – love the silk kimono and the Faria jacket. Being an old hippie at heart, I always check East out when I am in London. I own several of their printed Kantha quilt coats which I love and will wear forever. Not cheap but £-per-wear have been well worth the money. East’s sizing is good & unlike the rest of the high street they cater for over 14’s ( both size and age-wide !). 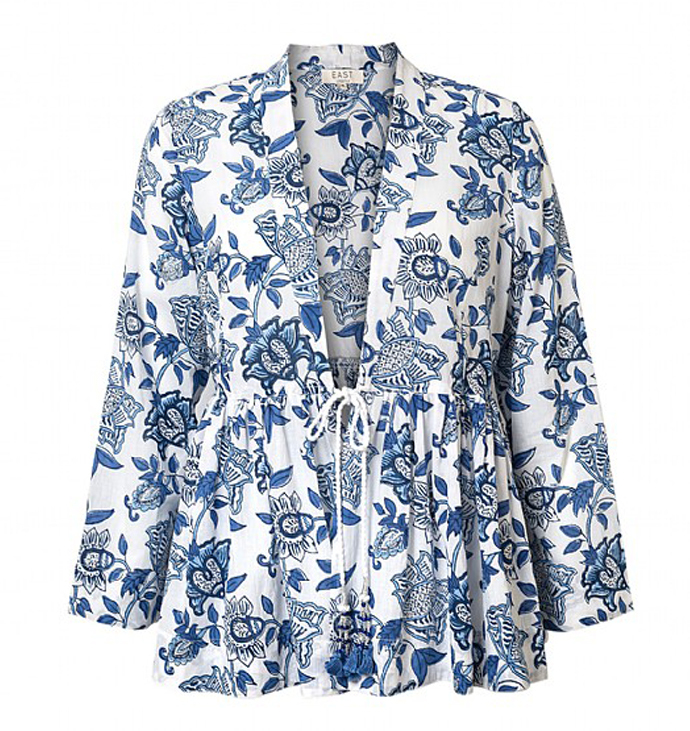 These blue and white Shibori-type pieces look good but I do find it a bit disappointing they missed the whole boho trend over the past couple of seasons — they could seriously have competed with Zara on the embroidery / smock dress front. To me it looks a bit M.i.H ish, but without the expensive advertising campaign. I think they could make it look a lot more desirable – such a big part of clothes buying is the feeling you want to buy rather than just need to. The local branch of East always looks a bit dark and jumbly. They could make it look a bit more enticing – the clothes aren’t exactly cheap. I was so happy to come upon this store on my last visit to London. Nice hot-weather clothes with sleeves are almost impossible to find but crucial for my ancient arms, and I had my hippie heart set on light, Indian print cotton. I can see why this company is popular with anyone not in the flower of youth (although 40 seems almost teenaged to me) as the combination of forgiving cuts, the aforementioned sleeves, and beautiful fabrics is rare. Some of the offerings are expensive, but others are quite reasonable. Obviously a personal opinion – I think many a fashion crime is committed under cover of the boho trend. But one piece, a top or unstructured jacket/cover up, can be very effective (and forgiving). I love the check stuff above, less keen on florals and think East can be a good resource but step away from the sequins/embroidery/waterfall cardigans…..
It’s great they go up to big sizes, but they don’t go small enough. I have seen a few things in there that I like but even the smallest size was too big for me. I am 5’4″ and really not that thin. Have three crinkle dresses from East, the first of which I bought years ago and is still going strong. They are all different, very versatile, and can dress them up or down, emerge from a suitcase in perfect condition, and all are machine washable and require no ironing at all. The colours haven’t faded and I’m always on the lookout for them in the sales, as they are brilliant. Love their brightly coloured scarves too. Cambridge has a large store on two/three levels and always pay a visit when there.